► How much more capable is the racer? Just how much faster is a racing car than a road car? How much of a difference do those slick tyres and spoilers really make? As it turns out, an awful lot. 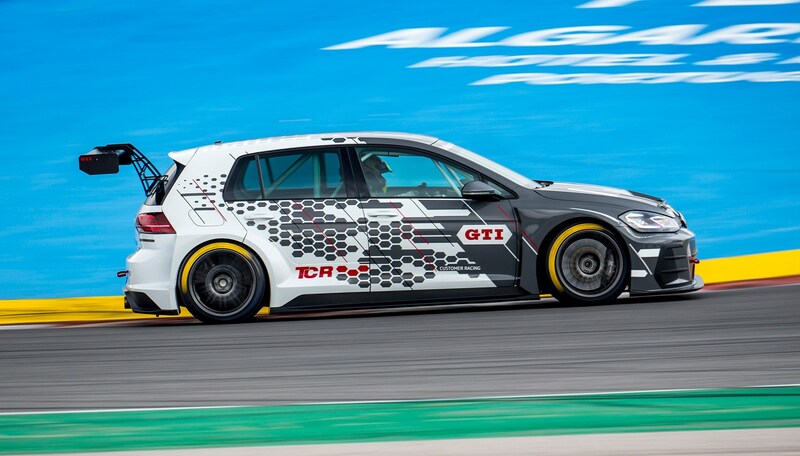 At the recent launch of the VW Golf GTI TCR road car at the undulating Portimao circuit in Portugal, we were unexpectedly offered a session in its touring car racing equivalent. Given that the race car is worth more than €90,000 and Portimao is big on blind bends, corner speeds and elevation, VW sensibly asked that all drivers followed a pace car, in this case a Golf R Estate. With 306bhp and all-wheel drive, the R is one very quick road car, potent enough to keep a supercar honest on a twisty road and a favourite among CAR magazine road testers. 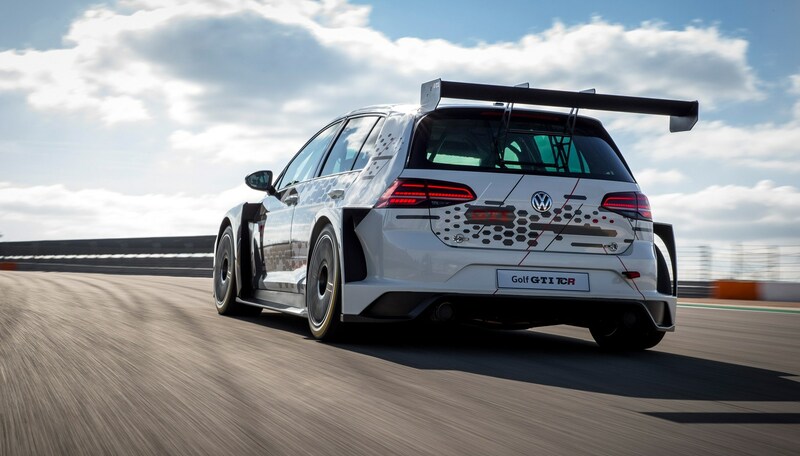 The VW Golf TCR race car uses the same engine, but boosted to around 345bhp, running through the same seven-speed DSG dual-clutch gearbox as the road car (leather gear gaiter and all). That’s in the racing car’s ‘standard’ trim – it can also be fitted with a six-speed sequential racing gearbox, as per the works Golfs that campaigned in the international WTCR championship by Sebastien Loeb’s team. But many customer cars, particularly those used in endurance racing at the Nürburgring for example, stick with the DSG. The wheels are pushed out far wider than the road car’s, within giant box arch extensions, and the enormous rear wing bolted to the tailgate is top-mounted, for cleaner airflow. I’m belted into the TCR’s surprisingly comfy race seat in the Portimao pitlane, behind the idling Golf R. My right foot rests on a standard throttle pedal from the road car, my left on a race-spec brake pedal. There’s such a distance between them it’s easier to brake with your left foot than your right. The removeable steering wheel is peppered with buttons for radio, headlamp flashers, differential maps (there are three – ordinarily you’d use the most aggressive setting for a sprint race, the middle to look after the tyres in an endurance stint or the kindest setting for wet weather) and so on. The dashboard is a lightweight plastic facsimile of the production car’s; so are the door cards, with neatly moulded cut-outs for the beefy rollcage. A giant metal lever is hinged from the transmission tunnel – it’s not a gearlever, but a handbrake, used for holding the car on sloping grids and for warming the rear brakes and tyres before a race. Setting off is as simple as sliding the gear selector to D and then nudging it across to manual mode (although you could drive the car in auto if you wished), in order to use the metal paddles behind the wheel. Taking care to warm the rear tyres, we start slow and gentle for the first few corners before pressing on. Or at least, pressing on in the case of the Golf R road car. Driven by a talented professional driver from VW’s driving experience programme, it’s being hustled to within an inch of its life. It’s all over the exit kerbing and beyond, two wheels off the track at points, and through Portimao’s fantastic final corner, a long, almost-flat-over-crest parabolica, the R is sideways at over 100mph. And yet the TCR car is barely breaking sweat. It could conceivably brake so much later, carry so much more corner speed. Where the road car is almost approaching some of the corners backwards and needs to pinch some of the circuit’s extra run-off on corner exits, the race car can drive around in the middle of the track, its warm slicks nowhere near their limit. So high is the TCR’s level of front-end grip, so far away is the onset of understeer, it feels almost as if you needn’t bother braking at all. When we return to the pitlane, the Golf R’s brakes and exhaust are furiously ticking with heat after its absolute pasting, but the TCR feels like it’s barely reached a canter. It’s a reminder that no matter how fast a road car feels, it can never be a match for a racing car.